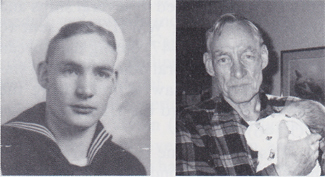 Clyde Seal, FCl/c, born Feb. 2, 1916, Marion, IN, joined the USN May 1, 1939. He was assigned to the USS West Virginia, F Div. and stationed at Great Lakes and Pearl Harbor. Memorable experiences include the attack on Pearl Harbor and the sinking of the Wee Vee; the sinking of the USS Henley (DD-391), Oct. 3, 1943; the tremendous typhoon of December 1944; and being aboard the USS Gushing at the Japanese surrender in Tokyo Bay. Married 48 years, he and his wife, Rosemarie, have five children, nine grandchildren and one great-grandchild. He retired in 1984 from Dana Corp., Marion, IN. He is a member of the Pearl Harbor Survivors Assoc., USS West Virginia Reunion Assoc., USS Henley Group, Tin Can Sailors and the American Legion.